Chicken Casserole is such a great way to use up leftover chicken and vegetables. After the holidays you can usually find cream of something soup on sale: I usually buy the cream of mushroom or celery. Any type is fine for this recipe. You might even consider making your own. Food writer Julie McGuire has a good recipe Substitute for Cream Soup. The following recipe is definitely meant to be a guide. You can alter the amount of chicken, rice and vegetables. 1) Pre-heat oven to 400 degrees. Heat olive oil in a large skillet on medium high heat. 2) Put cream of mushroom soup and wine in skillet. Heat until wine reduces about 2 minutes. 3) Add chicken broth and bring the mixture to a boil. 4) Add mixed vegetables when they are thawed add chicken and rice. 5) Pour mixture into a large baking dish. 6) Sprinkle with cheese and top with onion crisps. 7) Bake uncovered for approximately 30 minutes or until cheese and onion crisped are golden brown. 8) Let sit for 10 minutes before serving. By linking up this week you will be entered into a drawing for a $25 Walmart Gift Card provided by General Mills and Walmart through My BlogSpark. The winner will be announced at next weeks link up! I can't remember the last time I made Swedish Meatballs. 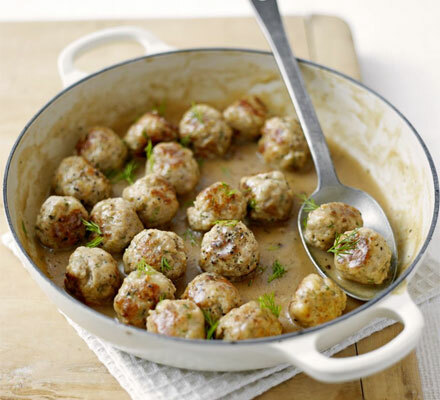 Meatballs are so much fun to make with little ones. What a kid friendly and adult pleasing meal. We enjoy them with a side of buttered egg noodles and Lingonberry or cranberry sauce. A dark green veggie like kale or spinach is a nice compliment to this dish. 2) Paste this html to the html page of the recipe you want to link to Foodie Friday. 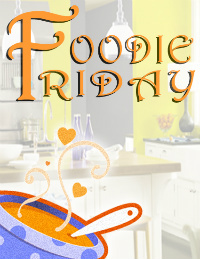 3) Copy the link to the recipe you want to add to Foodie Friday, not your homepage. 5) Past your link and type in the name of the recipe not your name. those meatballs look so yummy. Do you make lignonberry sauce, or buy it? I've always bought lignonberry sauce in a gourmet shop. I've never seen real lignonberries. They are native to Scandinavia and I don't know if they are grown anywhere in this country. Always nice to find a new recipe for leftover chicken. And thanks for the homemade soup link, look forward to trying. I thought the link would be highlighted. It might be easier to find it on my sidebar. I just love not wasting any leftovers either. Thanks for linking to Must Try Monday! I love recipes for using extra chicken. This chicken casserole sounds very tasty! I'm going to have to make this. Enjoy... it is definitely a comfy food dish. Thanks for stopping by... I do a lot with leftovers on my site. I hope you will subscribe. Your Casserole looks delicious! Hope you have a great week end and thank you so much for sharing with Full Plate Thursday. Your casserole looks tasty! Thanks for sharing your recipe with the Hearth and Soul Hop. I printed off that recipe for my next week's menus - thanks a bunch! You are very welcome. It is definitely a "can't go wrong" kinda recipe.